Evolving government mandates dictate that equipment manufacturers migrate to using chemicals that do not adversely impact the environment. In the refrigeration/ cooling arena, this means that manufacturers are replacing the old classes of chemical refrigerants that emit potent greenhouse gases, such as hydrofluorocarbons (HFCs) hydrochlorofluorocarbons (HCFCs), and chlorofluorocarbons (CFCs), with less damaging, green refrigerants that do not deplete the ozone layer and have low impact on global warming. For OEMs building refrigeration and air conditioning systems, these government regulations bring new challenges, not only for selecting the best type of refrigerant for the given application, but also for selecting components that can handle the specific refrigerant’s technical challenges and performance characteristics. The last five years have shown significant progress in this evolution as countries phase out the use of environmentally harmful synthetic refrigerants. The U.S. has already banned R22 (the halocarbon compound CHClF2 monochlorodifluoromethane), an ozone depleting refrigerant, from being used for air conditioning and moved to the next generation of R410A. While R410A is still not a natural refrigerant, it is an important first step towards a cleaner, greener direction. Some natural refrigerants are more efficient for air conditioning while others are more efficient for refrigeration. It is somewhat surprising then that Propane R290, which is a higher efficiency refrigerant, is being used in both markets. Usage seems to vary by geography in its application. In Asia, R290 is being used significantly for air conditioning applications while in the U.S. and Europe, it is being used primarily in refrigeration applications. Government regulations emphasize two important criteria in measuring whether or not a refrigerant is environmentally acceptable. Ozone depletion potential (ODP) is a measure of the relative amount of damage a substance can cause to the ozone layer. UV radiation from sunlight causes the release of chlorine in CFCs and HCFCs into the atmosphere, which then damages the ozone. Natural refrigerants, on the other hand, have an ODP of zero, meaning that they will not have any depleting effect on the ozone layer if they escape the system. Global warming potential (GWP) is a relative measure of how much heat a greenhouse gas traps in the atmosphere. The lower the GWP, the better a substance is for the environment. GWP compares the amount of heat trapped by a certain mass of the gas in question to the amount of heat trapped by a similar mass of carbon dioxide. A specific GWP is calculated over a time interval, typically 20, 100, or 500 years. Many of the refrigerants being used today have a global warming potential ranging from 1,400 to nearly 4,000. One can compare varying GWP values as they relate to types of refrigerants in Figure 1. Current HFC refrigerants R404a and R134a have extremely high GWP values ‒ 3,922 and 1,430 respectively ‒ that are harmful to the environment. By comparison, Propane R290 Hydrocarbon, which is a newer, natural refrigerant version of R404A, has an extremely low GWP of only three. At this time, most of the industry has transitioned away from R404A and has moved to R134A, but there are even greater benefits of transitioning to R290 in the future. Many of the new generation of natural refrigerants are hydrocarbon (HC) based as opposed to hydrofluorocarbon (HFC) based. Hydrocarbon based refrigerants include Propane (R290), Isobutane (R600a) – typically for use in small capacities like appliances, and R32, which is a blend of R290 Propane and another refrigerant. These naturally occurring chemicals operate in mid-pressure ranges of 10- 50 bar. Propane R290’s thermodynamic properties are superior to both the old HFC refrigerants R134a and R404a. Additionally, its heat capacity is approximately 90% greater than R134a and 140% greater than R404a. These characteristics allow R290 to absorb more heat at an accelerated rate, resulting in higher device efficiency, with faster temperature recovery and lower energy consumption. Hydrocarbons have no ozone depleting properties and low GWP. However, this new generation of hydrocarbon refrigerants is highly flammable and therefore require different and safer technologies for refrigeration and cooling systems and components. CO2 operates at almost twice the pressure of hydrocarbons in a typical air conditioning system, making it much more difficult to manage. On the other hand, CO2 has a GWP of only one whereas hydrocarbons have three times more global warming potential. Ammonia is another natural refrigerant now being used, although not as frequently as hydrocarbons. It measures zero for both ODP and GWP and breaks down rapidly. The challenge with ammonia is that its alkalinity is extremely corrosive, so components used in applications require careful consideration of material compatibility. Each type of natural refrigerant comes with challenges that OEMs and component manufacturers must overcome with technological innovation. In order to stay at the forefront of the green cooling trend, industry leaders are developing specialized components that are compatible with the latest common refrigerants - hydrocarbons, CO2 and ammonia. New products created for this market include a variety of pressure switches and sensors to meet different application requirements. Every component in today’s systems is specified to certain operating conditions and pressure ranges. While CO2 is not combustible like hydrocarbons, it does pose a different set of problems in that it operates at a higher pressure ‒ almost 2x the typical pressure level in a modern air conditioning system. This necessitates designing in specialized components such as pressure switches to ensure reliable operation in applications where CO2 is used, which in turn affects product manufacturing. For example, some beverage manufacturers are now requiring their beverage cooler vendors to switch from use of R134a to CO2. Because of the higher pressure running through the entire system, these cooling units now need a pressure switch incorporated for safety, and if they cannot be retrofitted, they need to be replaced with new units. In addition to the safety challenges, CO2 also operates less efficiently compared to hydrocarbons, requiring more electricity to achieve the same heating or cooling power. For example, pressure switches are required in CO2 refrigeration systems to protect against high pressure burst or over pressure situations that could cause the coils to rupture. When the pressure builds up to a certain point, the switch opens the electrical contact and turns off the compressor in the system, which is the heart of any refrigerating system. When the pressure drops back down to normal levels, it automatically switches the compressor back on. But in today’s market, even more safety is needed. Since switches are an electro-mechanical device, they inherently can spark when the contacts make or break. One of the biggest challenges of natural hydrocarbon refrigerants is flammability. To prevent a spark from accidently causing ignition of hydrocarbon refrigerants, Sensata has built extra safety into their pressure switches with a sealed design that ‘seals the spark’ inside by isolating the specific pressure media (R290) from the electrical switch assembly. Each switch is manufactured with a hermetic seal around the gas path as well as a sealant around the electrical connections. The electrical switch connections signal back to the system whether the switch is open or closed. This safety design completely eliminates the potential for explosion by stopping the gas from entering the electrical switch compartment where the arcs can be generated during contact make or break operations. Figure 3. Pressure switches like Sensata’s 25PS and PS80 have built in safety with a sealed design that includes epoxy backfill around electrical terminals. In researching the effects of natural refrigerants on their systems, OEMs need to know if the pressure switch has been tested with the specific refrigerant that they are planning to use. For R290 use, they need to know what the maximum current level of the switch is that prevents the arc from igniting the refrigerant, and whether it meets the required pressure actuation point and switch point. For C02 systems, operating with twice the pressure of conventional systems, the big concern is burst pressure. What kind of high pressure can it withstand? How long will it reliably operate under sustained high pressure environments? To address these concerns, and to also ensure that switches can withstand flammable refrigerant applications, pressure switches specially designed for hydrocarbons can be submitted for rigorous testing by external agencies. Testing demonstrates that Sensata’s 25PS series sealed pressure switch operates safely in refrigerant equipment. Repeated initiation of a spark inside the switch compartment will not ignite the surrounding atmosphere. Sensata’s 25PS series of Automatic Reset Pressure Switches were subjected to tests of IEC 60079-15:2010 standards and were certified to meet the requirements for operating in explosive atmospheres. The 25PS and PS80 series switches have also been tested up to 100,000 life cycles and 345 bar (5000 psi) for burst pressure. To obtain system pressure information, a pressure sensor as opposed to a switch, is needed. A pressure switch is strictly for safety. In contrast, a pressure sensor provides safety information as data that can be used to increase energy efficiency in the system. If the goal is to maintain pressure within a constant range, the pressure sensor can be used to regulate the system. For example, if the pressure goes outside the normal operating range in a supermarket, a pressure sensor could provide feedback that could activate the pressure switch and/or turn off or on the condenser system to bring the pressure within the specified range. In addition, the pressure sensor could notify a technician or maintenance organization of the issue for a more permanent fix. This could be a simple local alert or it could send an alert via the cloud to the appropriate person or company. Many system OEMs could also use the data generated by a pressure sensor to understand how their HVAC and cooling systems function over time. 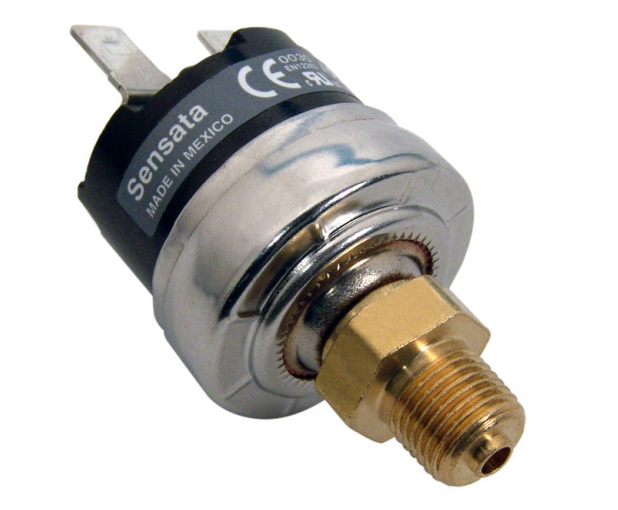 • Pressure switches provide the crucial safety factor. 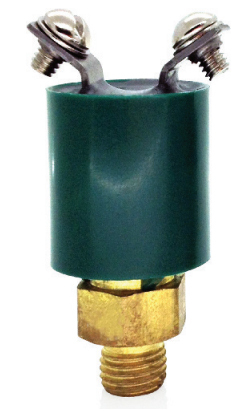 • Pressure sensors allow real time monitoring, system automation and maintenance feedback. Given the changes in refrigerants being used around the world, it is clear that natural refrigerants are important to the future landscape of the industry. As OEMs research their choices, component manufacturers must meet the design challenges posed by these non-synthetic refrigerants in order to optimize safety and efficiency. A critical part of this evolution is the knowledge of what kinds of hardware and systems must be specified for the safe implementation of these new and more technically challenging materials.